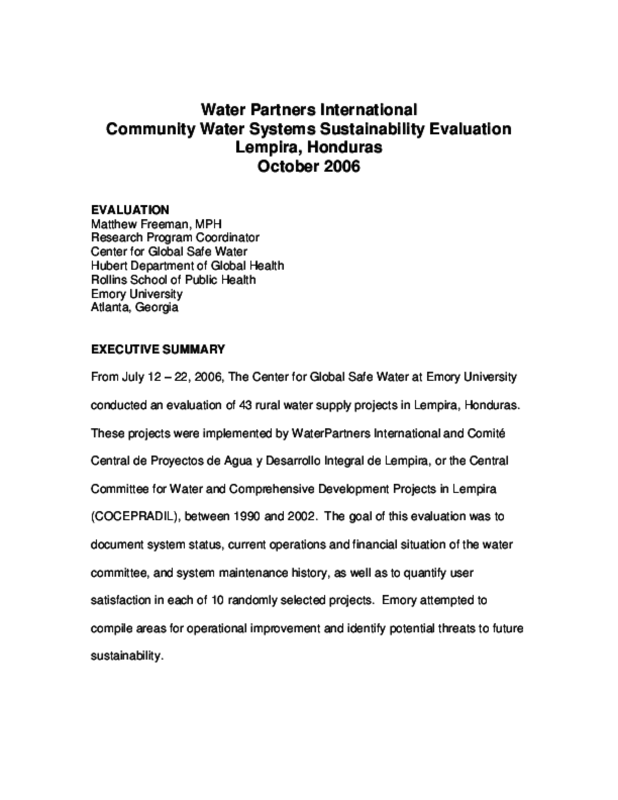 Emory University's Center for Global Safe Water studied a random sampling of 10 out of 43 water projects in Honduras implemented between 1990 and 2002 by WaterPartners International and Comité Central de Proyectos de Agua y Desarrollo Integral de Lempira or the Central Committee for Water and Comprehensive Development Projects in Lempira (COCEPRADIL). The goal of this evaluation was to document system status, current operations and financial situation of the water committee, and system maintenance history, and to quantify user satisfaction in each of 10 randomly selected projects. None of the communities reported a significant number of broken or abandoned water points; nearly all of the communities surveyed had increased the number of water points from the beginning of the project and all were still collecting the water tariff. Community satisfaction was high throughout the study area for nearly all categories: quality, quantity, accessibility, affordability, and access. Kind of Study: Randomized Control Trial (RCT). Grey literature. Sample Size: 10 randomly selected rural water supply projects out of 43 projects in Lempira, Honduras. Timing of Study: July 12-22, 2006. Copyright 2006 Center for Global Safe Water, Emory University.